"File Folder Heaven was created by a Special Education teacher, for teachers, parents and all people working with, preschoolers, early elementary students and students with Autism and other disabilities. File Folder Heaven offers a wide variety of printable file folder games, printable books, preschool activities and Autism tasks that provide children with hands-on opportunities to practice basic reading, math, science and social studies skills." 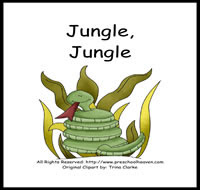 She is recently expanding into the preschool area and would like to extend the opportunity to download a free printable unit called "Jungle Jungle." The unit includes; 1 Make-a-Match book, 12 file folder games, and 3 activity mats. Thanks for posting Trish! :) There are many more free printables on the website. Unfortunately my webhost, Host Gator is having some issues on their end this morning. If you can get on the website, please be patient, they should have it up momentarily. Nice resource, thanks for sharing. My preschooler will love these.